"In the far future... a universer trembles. It is the far future; the human race has finally colonized the galaxy, preserving an era of prosperity that's only possible because of The Hypernaturals. They're a celebrated, galaxy-wide superhero task force that keeps the peace. That is, until they all mysteriously vanish. Now, as the galaxy teeters on the brink of chaos, it's up to a group of retired and long forgotten Hypernaturals -- and their novice recruits -- to save the galaxy from complete destruction. Dan Abnett and Andy Lanning, the superstar writing duo behind Annihilation and The Legion, launch an all-new original graphic novel series that takes cosmic super-heroes to a new frontier." 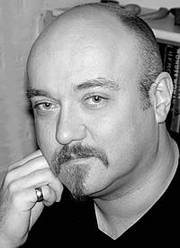 Dan Abnett is currently considered a "single author." If one or more works are by a distinct, homonymous authors, go ahead and split the author. Dan Abnett is composed of 29 names. You can examine and separate out names.